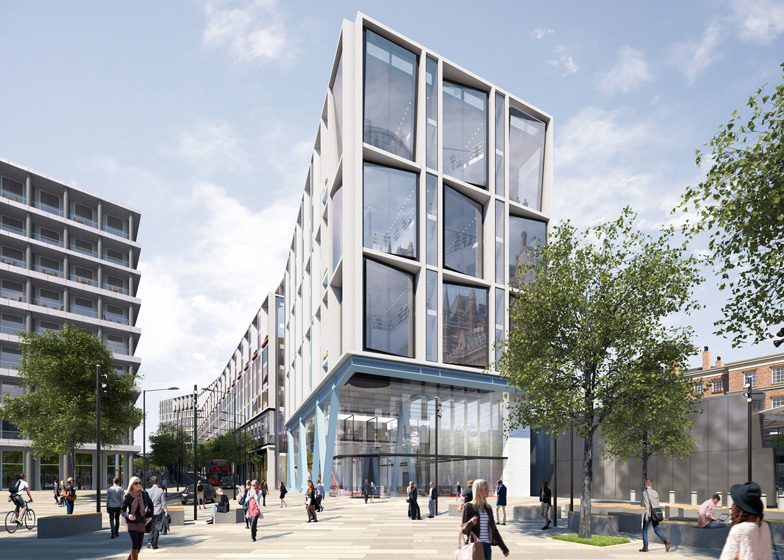 News: London firm Allford Hall Monaghan Morris has applied for planning permission to construct a 27-hectare headquarters for Google in London's King's Cross. The new UK headquarters will consolidate Google's London operations into a single building, replacing existing offices in Covent Garden and Victoria with an 11-storey structure that stretches 330 metres from Regent's Canal towards King's Cross Station. AHMM's designs feature a steel-framed structure with cross-laminated timber panels. Bold primary colours will be picked out on the exposed steel members, intended to reference the painted metalwork of the neighbouring railway stations. AHMM director Simon Allford commented: "This building is underpinned by cutting edge design intelligence and technologies to provide a sophisticated twenty-first century working environment for Google's staff." "The architectural approach, which has taken inspiration from King's Cross and St Pancras International railway stations, complements the local area's strong industrial heritage and will be a building London can be proud of." Construction will start early next year and the building is set to complete in 2017. Shops, cafes and restaurants will occupy the ground floor and the rooftop is set to be a garden. Google's current office in Covent Garden was designed by PENSON and features Union Jack flags and vegetables allotments, while the Victoria headquarters by Scott Brownrigg contains dodgem cars, red telephone boxes and beach huts. Other Google offices we've featured include Google Tokyo, with references to traditional Japanese culture, and Google Tel Aviv, with a make-believe beach and slides. The company is also working on a 100,000-square-metre campus for California. See more stories about Google. London firm AHMM is led by Simon Allford, Jonathan Hall, Paul Monaghan and Peter Morris. Recent projects include a hospice designed to look like an oversized house. Google has today confirmed submission of a Reserved Matters application to Camden Council, with designs for its new £650m UK headquarters. The one million square foot building will make up part of the 67-acre King's Cross development scheme. As part of one of the largest urban regeneration schemes in Europe, Google's building is expected to generate 1,500 construction jobs. Overall, it is estimated by King's Cross Central Limited Partnership (KCCLP) that the development will have 35,000 people working there once the whole development is complete. Subject to approval, work will start on the new UK headquarters early in 2014, with completion scheduled for late 2016, through to 2017. The new building will house all London-based Google staff, who will relocate from current premises in Victoria and Holborn. Google has long-held aspirations to house all London-based staff under one roof. King's Cross, a rapidly-transforming area of London with incredible potential for growth and employment, was identified as an ideal place to locate the office, the first purpose-built headquarters built by Google anywhere in the world. The exceptional transport connections, allowing easy access within London and the UK, as well as areas of Europe, were another attraction, and it is hoped that these will help establish the area as a new hub for technology, media and telecoms companies. Google acquired the long lease of the 2.4 acre site from KCCLP, who are making the Reserved Matters application on Google's behalf. Commenting on Google's decision to build their UK headquarters at King's Cross, Dan Cobley, Google UK's Managing Director said: "Building our new headquarters in King's Cross is good for Google and good for London. We're committed to the UK and to playing a role in the regeneration of this historic area." The architects, AHMM, has been working on the plans for nearly two years, taking inspiration from the area's unique industrial heritage. Commenting on the design, Simon Allford, Director of Allford Hall Monaghan Morris, said: "This building is underpinned by cutting edge design intelligence and technologies to provide a sophisticated twenty first century working environment for Google's staff. The architectural approach, which has taken inspiration from King's Cross and St Pancras International railway stations, complements the local area's strong industrial heritage and will be a building London can be proud of." The 1,000,000 (gross) sq ft new UK headquarters features 725,000 sq ft of office space and around 50,000 sq ft of retail space at ground level. The building ranges in height from seven storeys at the south end closest to King's Cross Station to 11 storeys at the northern end overlooking Regent's Canal. The building has been designed to meet the highest standards of environmental sustainability, ensuring low energy usage and incorporating state-of-the-art materials. Much of the internal structure will be constructed using steel framing with cross laminated timber panels - a first for a contemporary building of this scale. The aspiration is to achieve BREEAM Outstanding and LEED Platinum ratings and deliver an overall carbon saving of 40%. The external design of the building pays homage to the broad industrial history of the local area, including steel columns, pre-cast concrete panels and low-iron glass. Bolder colours will be introduced through painted steelwork, taking inspiration from architectural elements nearby, including the metalwork at St Pancras International. Speaking about the significance of the project, David Partridge, director of Argent (King's Cross) Ltd. said: "This project is hugely important for King's Cross and underlines our commitment to support world class design. It will attract further investment into the wider area and act as a catalyst for the local economy and the community which we are building."